Manchester City forward Raheem Sterling has shown he’s a class act by getting in touch to congratulate Mason Greenwood on his breakthrough into the Manchester United senior side. The 17-year-old has enjoyed a remarkable rise this season, catching the eye at youth level to make his full debut for Man Utd in last week’s Champions League win at Paris Saint-Germain and then a Premier League debut away to Arsenal a few days later as well. 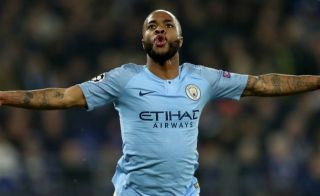 It must undoubtedly be a nerve-wracking experience for any kid when they first come through, and Greenwood will surely appreciate this reported gesture from a top player like Sterling. According to the Daily Mail, the City star sent Greenwood a text message of congratulations, to which Greenwood replied referring to him as one of his idols. The England international sometimes gets an unfair rep in some sections of the UK press, but there seems little doubt that he’s a committed professional and an all-round good guy in most areas of his life, even if he made the wrong impression with his handling of his departure from Liverpool. In fairness though, he’s been fully justified in leaving Anfield for the Etihad Stadium, where’s only gone from strength to strength and helped himself to a few big trophies.